Strip malls are not usually the first place I think to go to when looking for a dinner out. 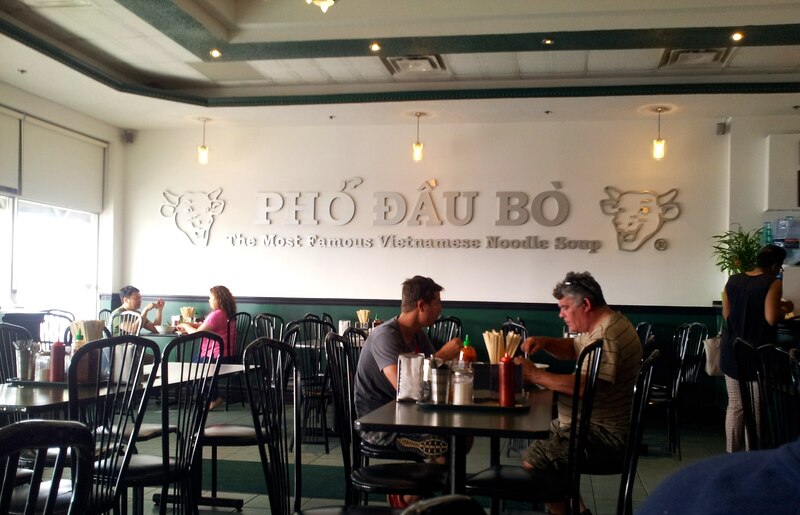 But that was until I tried Pho Dau Bo on Gillingham Drive near the corner of Bovaird Drive and Main Street. This is one of 11 establishments located all over Southern Ontario. The décor is simple with images of the other restaurants and minimally furnished with basic tables and chairs. Every time I go, there is invariably a handful of people enjoying their meals and a constant flow of new guests and people collecting take away orders, but it’s never over crowded. Their tag line is “The Most Famous Vietnamese Beef Noodle Soup,” which is usually what I order, but for the purposes of this review, my group of four gladly ventured out of our norm and were rewarded with new, delicious samplings for our daring. At Pho Dau Bo, you write down your order on a paper at the table that a server then takes to the kitchen. 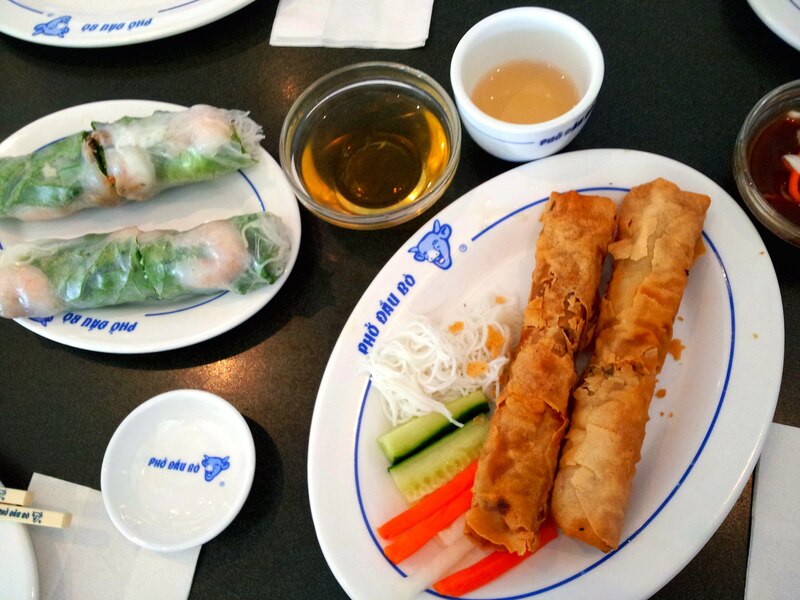 While sipping our complimentary green tea, we made our choice of starters: Vietnamese style deep fried spring rolls (#101), Vietnamese style shrimp, pork, and salad rolls (#104), mango salad (#112), Vietnamese style rice cakes with shredded pork (#106). I’m not usually a fan of deep fried food and always insist on ordering the salad rolls, but despite my tastes, these spring rolls are light, fresh and not super oily. The two rolls compliment one another; fresh and “healthy” and deep-fried crunchy. 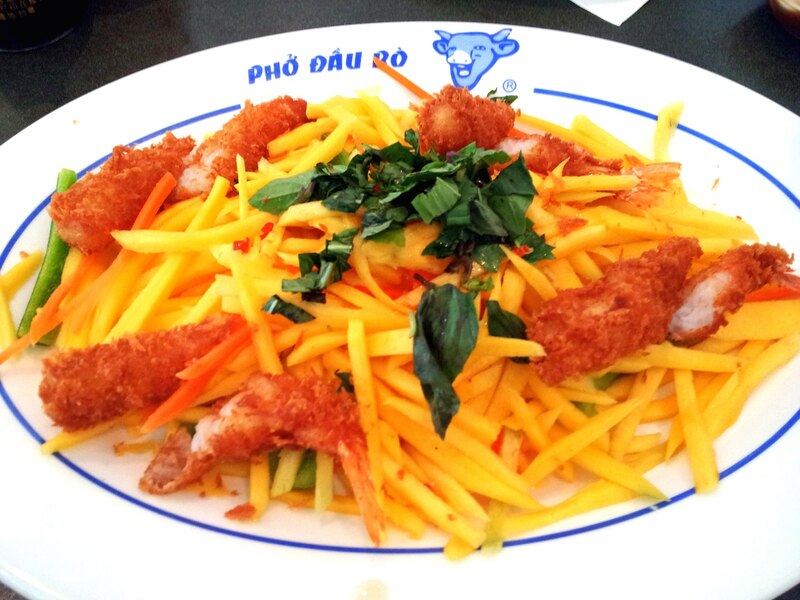 The mango salad was tangy and sweet with a mix of fruit, veggies, and crispy shrimp. I’d never tried Vietnamese-style rice cakes before so I had nothing to compare them to but, it was an interesting mix of textures and savoury flavours. For our mains, we ordered ‘Singapore style’ stir fried vermicelli with assorted meat and veggies (#824), and Vietnamese style beef stew (#306). 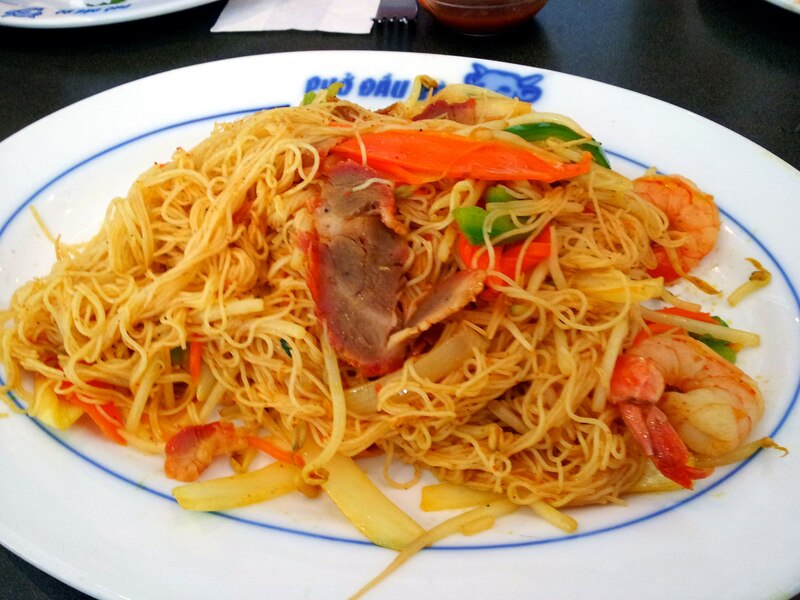 Singapore noodles has always been one of my favourite dishes with it’s spicy flavours and bright orange colour. The pho was meaty and flavourful with large pieces of vegetables and oodles of noodles. This is a great place to come to if you are “hangry” or in a hurry. The food is speedy and usually comes out all at once or as soon as it’s ready. It’s hot, freshly made, and authentically good. Overall, this place is cheap and cheerful, with friendly staff and a clean environment. It’s utilitarianism at its best, harkening to its Vietnamese pedigree of the cafes and restaurants found in Ho Chi Minh City today. Dinner for four came to $42.66 plus tip. 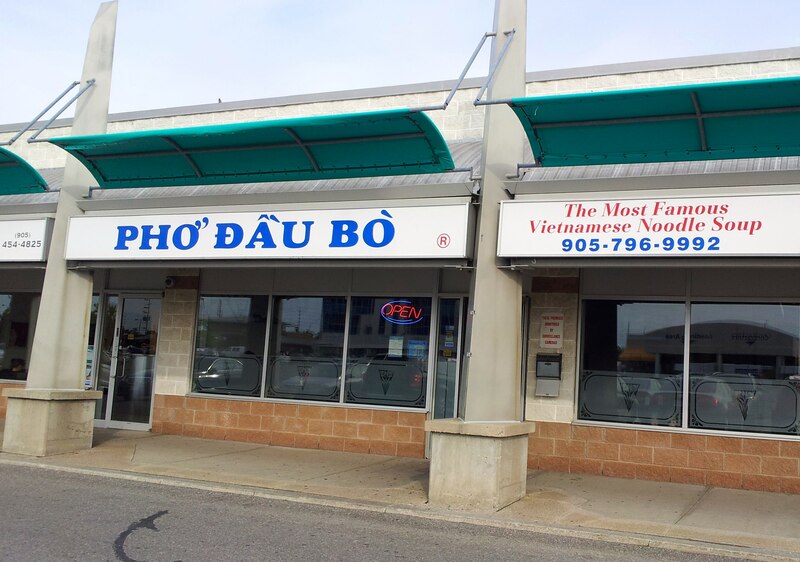 Wasn’t Pho Dau Bo Brampton Review fantastic ? Comment below and tell us about your favorite Pho place in Brampton.